A 1990 Chateau Montrose or a $9 Shiraz, handmade birthstone stoppers preserve any wine in style. There's the 1990 Chateau Montrose that you saved for your 35th birthday, and then there's the $9 Shiraz you pair with a Saturday night movie. In either case, we think all wines deserve to be preserved in style. 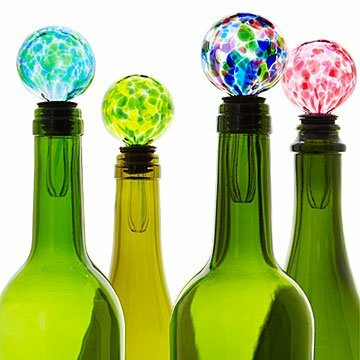 These hand blown glass birthstone toppers celebrate a special month while keeping a favorite libation fresh. Designer Jill Henrietta Davis heats clear glass to 2,000 degrees, then rolls in bits of crushed colored glass before forming the vibrant globe. It's a great excuse to let loose like it's your birthday and open that second bottle. After all, there's no pressure to finish it. Handmade in Pawtucket, Rhode Island. Join us for a trip to Jill's studio on our blog. During her freshman year studying fashion at Parsons School of Design, Jill Davis realized her clothes were more like wearable sculptures than fashion. She wanted to stay at Parsons, but she began exploring other departments. The day she walked into the glass studio and saw molten glass for the first time, her search was over. "Glass is the most challenging and rewarding material I have ever encountered," says Jill. "You can’t bully it—you are perpetually persuading and coaxing the glass into shape. Even the best living master glass blowers cannot always get the glass to do what they want! It’s this feisty streak that keeps me enchanted." See the interior and exterior of the card included with your Birthstone Wine Bottle Stopper. Yes, I would buy these again! It's beautiful, easy to use and just awesome! Such a great gift. Attractive and easy to use. I gave this to a friend who has everything. She love the birthday month coordination and it looked great in a bottle on her bar. This winestopp is beautiful and the birth stone perfect. Perfect for the unfinished bottle of wine. This product is so beautiful! My friend enjoys entertaining. A beautiful bottle of wine with this gorgeous bottle topper will be a fun addition to her conversations. This gift was a great way to link the recipient's love of colored glass globes, wine, and her birthstone. The perfect gift!